Square Enix doesn’t disappoint with this soundtrack at all. They went all out on the soundtracks for Final Fantasy XIV. Some of the music tracks from the expansion Heavensward really get the emotions rolling. They also get you hype for parts of the game, like certain dungeons and story quests. 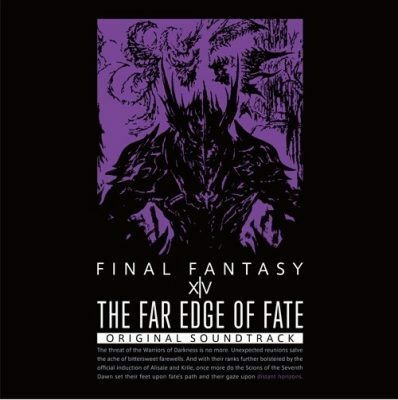 I’m here to gush over the newly released The Far Edge of Fate OST. Why am I gushing over it? Simple. This soundtrack goes hand in hand with Heavensward‘s soundtrack, and it delivers. If you’re a gamer who has touched this game and got highly invested in the story and characters while you guide your own warrior of light, you need this soundtrack. Revenge Twofold – There is a certain theme that was present through FFXIV: Heavensward‘s dungeons and story quests, one that you can hear people singing the lines “Guide us, oh mighty fury! Guide us to victory!” and this by far is my favorite one next to Imagination. Teardrops in the Rain – This is the theme from Weeping City of Mhach, one of the 24 man raids in FFXIV. At first, I didn’t really mind this track, then it grew on me. Goodness. Now it is one of my favorites. Torrent – Listen to this one with headphones. The bass is divine. You’ll keep this one on repeat. Rise – This one has to be my favorite of the Alexander raid themes. It is like all the fights so far have come to this really big conclusion, and this song makes the last fight go with a bang. It is fun to sing along to, even if you can barely understand the lyrics. I can say my favorite line is “Rise with me rise with me rise with me RISE UP….” Yeah, it’s a good song. A lot of people like it. I could keep gushing about how great this game’s soundtrack is, but the only other way I can tell people to experience it is through playing the game itself. Then you’ll see why every note is well chosen and fits the story and situation at hand. I have to say, this is one of my favorite game soundtracks of all time, and I am sure that if others give it a listen, they’ll fall in love just like I did.